Why Does My Puppy Keep Throwing Up? Hi, I have a six-month-old Westie puppy. Over the last week or so, every now and then he throws up after eating his dinner. He will be fine for ten minutes or so after eating, but then will start whining and running around frantically, sometimes howling. He then throws up and eats the food again. He seems completely fine afterward. He doesn't do this frequently, it just happens every now and then. Recently he has been eating his food a lot slower than usual. Twice in the last couple of days he has left a bit of food in the bowl, and looks at it like he wants to eat it but then walks off. I picked some of it up out of the bowl and he ate it out of my hand without any problem. He still goes mad for treats and his stools are normal. He drinks plenty of water and has had no change in personality since this has started. A lot of the time he eats his meal normally. He is teething a lot at the moment and a lot of his teeth are falling out, but I don't know if this will affect anything. He has had no change in diet, no change in environment, and the weather is cold so it wouldn't be heat related. Sounds like you've put a lot of thought into this already. There are many things that could make your dog throw up his food this way and eating it again is actually quite natural for a canine. Based on your description, I have a few questions of my own. What is going on right before your dog throws up after his meal? Is he gulping water immediately before or after his dinner? That would cause the food to start bloating and make his stomach feel even fuller than it is. Does he seem anxious about anything in particular when he begins running around and whining? Westies can be a bit high strung at times, and some dogs will force themselves to throw up when they get overly excited on a full tummy. What does the [food look like when he throws it up? Is it still in kibble form or does it look ground up? His lack of teeth at the moment might prevent him from chewing as well as he used to, but if the food still looks somewhat whole, there's an outside chance he has some sort of regurgitation problem developing. 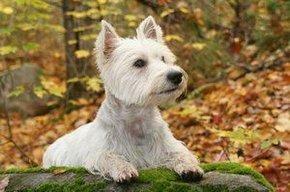 Schedule an appointment with your vet to discuss what is happening and have your Westie examined. Bring in a sample of the vomit if you're able to collect one prior to the appointment. Spread your dog's normal daily ration over two to three meals throughout the day, rather than one. This will reduce the amount of pressure on his esophagus and tummy after each meal. Try changing his after meal routine to distract him from running around. Picking him up for a nice snuggle may keep him calmer and help keep his tummy settled. Thanks for your question, and let us know how everything works out.